Volume VII of SEC Power Rankings as we hit the halfway point in SEC play this week. Welcome to the 7th edition of SEC Power Rankings! Due to so much other content I’ve had going out over the past few days, this will be short on commentary from yours truly but that’s where you come in. Let me know what you think of where each team in the SEC stands in the comments below! Vols were tested in both road games this week but pulled away late for comfortable wins and continue to roll through the SEC. They keep to stay at home this week. One of the hottest teams in the country right now. Destroyed Vandy in Nashville before getting tested in the Swamp on Saturday, down 11 early in the second half before turning on the jets to pull away from the Gators. The loss to Arkansas at home is a head scratcher to me as the Hogs controlled that game before the Bayou Bengals made a wild comeback before falling a point short. Big week for these Tigers ahead. Like so many before them, the Bulldogs fell in Tuscaloosa before avenging their home loss to Ole Miss by winning in Oxford on Saturday. They get 2 of the 3 best teams in the SEC at home this week so a golden opportunity for the Bulldogs awaits. No shame in losing to Tennessee, everyone’s doing it. They’ve got an uphill battle tonight at Rupp Arena before a tossup game at home against the Hogs this weekend. 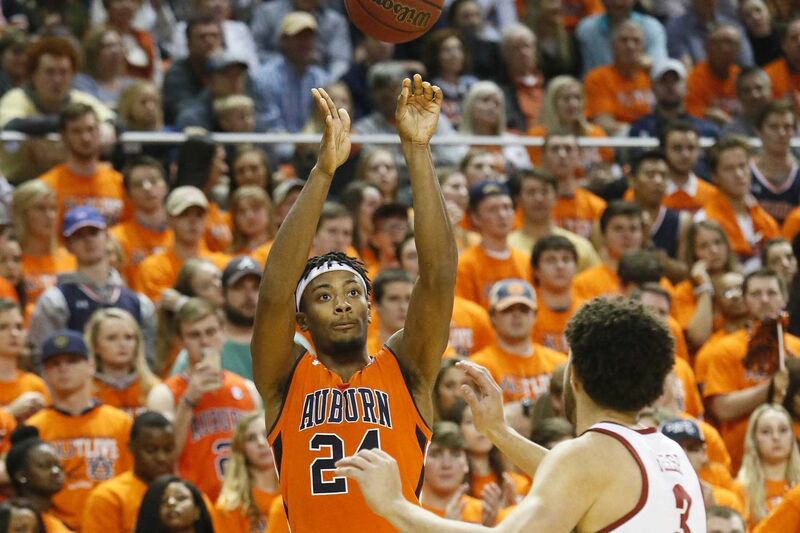 Auburn picked up 2 much needed wins this past week inside Auburn Arena and both were quite convincing. The first half against Mizzou was a struggle as the team held just a 3-point lead at halftime. Auburn shot 5-21 in that first half and perhaps doubt creeped into the minds of the Auburn fanbase. Their response: their highest point total in a half this year (58), finally eclipsing Auburn Football’s 1st half total in the Music City Bowl. Auburn came out on fire against Alabama building a 20 point halftime lead and holding steady in the second half. Auburn’s defense was a big part in both wins as they didn’t let Mizzou’s excellent 3-point shooting beat them nor did they let Donta Hall dominate them on the inside as I feared. Auburn has 1 more game at home before going out on the road again and they could get Austin Wiley back this week. Winning at LSU isn’t impossible and would be a massive win for Auburn if they could somehow go down to Baton Rouge and get the job done. Alabama continues to be a Tale of Two Teams, really good at home and not so much on the road (sound familiar Auburn fans?) John Petty did his best to keep Alabama in the game Saturday but nobody else hit double figures except for Kira Lewis Jr. for Alabama on Saturday. Ole Miss has come back to earth after peaking against Auburn and Mississippi State on opening week. Rebels really need to care of business this week to try and get back on track. The Gators led 42-31 against Kentucky with 14 minutes left and then the wheels fell of the Gators offense. Florida made just 5 shots in the last 14 minutes of the game (2 in the last minute). Things don’t get easier for Florida as they play here tonight before heading to Knoxville this weekend. The Hogs had the biggest surprise of the weekend, knocking off LSU in Baton Rouge after holding off a furious comeback from LSU. In their last 4 games, their only loss is a 3 point decision at Texas Tech so things are looking up in Fayetteville at the moment. After going into the locker room only down 3 here in Auburn, the second half was a disaster on both sides of the floor. But they bounced back on Saturday to beat Vanderbilt but have another brutal road test tonight in Knoxville before a winnable game Saturday. After scoring 98 on Texas the previous Saturday, the Bulldogs couldn’t sustain that momentum and dropped a pair of games this week. We’ll see if they have any luck in Tuscaloosa before hosting a struggling Ole Miss team. The Aggies fought valiantly for a good portion of the Tennessee game before the Vols took over late for a 17 point decision. Aggies hit the road twice this week. The Dores got demolished at home at the hands of Kentucky 6 days after taking to Tennessee to Overtime. It was an ugly look to say the least. The Dores are still looking for the first SEC win of the season.